Long stretches of industrial landscapes. Endless expansion of freeways and suburbia. Homogenous storefronts. Dilapidated storefronts. Islands of civic amenities surrounded by six-lane traffic. Gravel-covered parking lots everywhere you turn. Underused green spaces. Spartan sidewalks. Dust. Dirt. Trucks. Listening to Vancouver-based landscape architect Greg Smallenberg give his lecture on reclaiming lost and forgotten urban spaces last Friday evening, I wanted to believe him in thinking that a city perpetually needs the derelict in order to inspire change. However, I couldn't quite accept that notion wholeheartedly when thinking specifically about Edmonton. Smallenberg—who's made a name in turning wasted urban space such as dead zones below freeways into average inhabitable human spaces—hinges his practice on the notion of turning the incidental into the exceptional. Speaking largely to a room of architects and artists, with at least one city councillor taking notes, Smallenberg gave a series of examples of how civic intervention can reclaim spaces both temporarily and dramatically. From traditional examples such as New York City's High Line park and Melbourne's revitalization of its back-lane alleys, to guerilla examples of planting flowers in potholes and creating a movable forest consisting of shopping carts planted with trees, Smallenberg's examples pressed the idea that we need to see the potential in our existing spaces and engage these spaces with human activity. There's a tendency to turn to art, or the idea of art, as the stand-in presence for human activity, as art in the broadest sense engages and enriches our perceptions of the world. But engaging in art and design alone is clearly not enough to provoke potential, as that art needs to consider its demographic in terms of traffic density, population diversity or what can be summed up as the lost space's relational engagement with its surroundings. Looking at downtown alone, I think of spots like Beaver Hills Park or Churchill Square, public spaces that have undergone major renovations and still somehow fail to live up to their potential as civic centres. Formerly a derelict park used mostly for trafficking or using drugs, the tiny park on the corner of Jasper and 105 Street is today a leisurely layout with a mini-waterfall and small, rolling hills ideal for weekday picnics. Only, situated alongside two major corridors of busy automobile traffic, it's never a resting place that makes you want to linger. Its size remains more decorative than inviting, and the public art is more suited to a playground or at least near a bike path. A few blocks east, the Square is sizable in scope and is making attempts with more sitting areas, but I still doubt if anyone ever proposes Churchill Square as a meeting place or thinks to go there as a social outing outside of a festival context. What Edmonton has always lacked has been a year-round gathering place where one can just go and be socially engaged without participating in a framework of commerce. The battle may not actually be between public and private space, but about what we consider free spaces. Churchill Square is designed as a blank slate to host major events rather than welcome everyday citizens, and in redefining what derelict means in terms of civic engagement, spaces like the Square rank just as derelict in terms of everyday human engagement. Exploring the potential of urban open spaces is not to just look at the forgotten or ignored, as those spaces are more often than not inhabited already, but inhabited by what has been deemed socially undesirable. While we continually redevelop our cityscape, we should first cater to the needs and desires of those walking the city streets rather than pander to the inflated projections of what may or may not come. With such a declarative title as We Don't Talk About the Weather, one could only assume the current ArtsHab One exhibition would address everything but the trivial and the mundane. But be forewarned: the title and works have very little to do with each other. According to the show's organizer, Robert Harpin, the title is suppose to be tongue-in-cheek, but I can only gather that being tongue-in-cheek rests on a fine line between being humorous and being nonsensical. "Most of my works are more funny than serious, or at least hopefully they are," Harpin says, who is a current tenant of ArtsHab One and gathered his peers for this group exhibition. "And when you name your show We Don't Talk About The Weather, people are going to come to the show and talk about the weather. It's kinda funny that it's a way to introduce things or start a conversation, and I feel art starts conversations as well." From the conventional to the silly, the works range from more established artists like Gloria Mok to new last-minute experiments by Eric Burton. Conversation starters or not, the offering of work hinges on the idea of collage, but with little insight into the variety of collages offered, the show is a mish-mash of concepts that are held very loosely together. Calgary-based artist Michael Welchman offered the most engaging work, filling out an aged portrait of a British Commander-in-Chief in South Africa with drawings that seem to haunt the old Field-Marshall. While I am told there is a video component to the work, it was not present on the day I visited, but the portrait alone showed the most coherent artistic concept bridging the realm of existing images with the imagined narrative possibilities of collage. The other strongest works belonged to Mok, who stands out from the rest of the group quite immediately in form and execution. Harpin, who knew all of the artists except for Mok, feels that she actually tempers the exhibition. "I'll probably get into trouble for saying this, but Gloria situates the show. She makes it seem more artistic," Harpin says, before adding, "The rest of the show is silly, but she remains very true to the original sense of the word collage, giving a place of where the rest of the work is coming from." Mok, who then assumes the anchor point for the show, plays between the real and the imagined of the natural world with watercolour collages she already had in the studio. "I have a background in science and medicine," shares Mok, who is a practicing doctor by day. "So these concepts are quite familiar to me, but they are all imagined forms, inspired from the mind." Facing most of Mok's collages are Harpin's own works. Predominantly occupied with the notion of hyper masculinity in pop culture, his boyish collages carry through a camp theme that is certainly more '50s retro in aesthetic. Working with sparkles and one-liner texts like "Dentists are nice" and "We Have No Agenda," Harpin's works engage the viewers to read into his juxtapositions, but falling just short of absurdity, his contrasts lack their suggested depth and process for this reviewer. Soon to be the first tenants of ArtsHab Two, Harpin with wife and artist Aspen Zettel, hopes to continue organizing shows in the new building on 118 Avenue, and it is with hope that the next show will ignite a conversation that goes beyond the surface scope of not talking about the weather. Acquiring works from fine art to ethnographic artifacts since 1908, the University of Alberta is not only one of the oldest collecting university institutions in Canada, but also one of the largest. As one of the institution's 35 different collections that range from print to earth sciences, the art and artifacts collection has put together a two-part exhibition inspired from donations and additions acquired over the past seven years. Jim Corrigan, curator of the University of Alberta Art and Artifact Collection, has gathered 46 art works and artifacts made by 34 artists and craftspeople from around the globe spanning centuries. The first half of the series, Human / Nature: Portraits, contrasts historical prints by William Hogarth and Francisco Goya to contemporary prints and drawings by Helen Kalvak and Pitseolak Ashoona. Culling from over 2500 works collected since 2003, Corrigan notes that he began to see a pattern on human nature, particularly on portraits and landscape, which will be the second part of the exhibition series. It is arguable that most works of art address the theme of human nature in some manner, as art in its essence is a continual dedication to shed light on the intangibles of existence. From Edo-era hairpins to beaded moccasins to a contemporary self-portrait by local painter Julian Forrest, the exhibition certainly appears discombobulated in what it is trying to say, but the show does celebrate the Friends of the Museum's 25th anniversary by exemplifying the depth and global reach of the U of A and its friends and associates. Aware of the ethics of collecting and exhibiting works from other cultures and turning them into art objects rather than contextualizing them in their history, Corrigan shares, "Everyone that looks has a bias and a point of view, and it's important to understand that you have one and that you have a consensus on what you're trying to say. "I wanted to make people think about objects in a different way, by placing things together like traditional adornments to figurative representations," continues Corrigan, who notes that the limitations of space also inhibited the amount of works to be included. With some gems like the large prints by Seishi Ozaku, who combined woodblock prints and transferred them to lithography plates, it is the first work the print-focused U of A has acquired that uses this particular technique. Emphasizing most strongly the importance for the collections to reach a larger public, he says, "Taking a line from the President's message: we need to be connected to the community. It's important for people to know that we have these collections and that they are not just for people on campus." The second part of the series opening in June will focus on landscapes, and it appears similar in scope. Featuring a newly acquired Lawrence Harris that the Group of Seven artist gave as a gift to Emily Carr, a 1530 woodblock by Albrecht Altdorfer, one of the earliest western artists to use landscape as more than a backdrop, and a gift of a 1930s etching of the U of A as seen from the north side of the river, the broad Human / Nature series may not fulfil a clear vision of an educational exhibition, but it does satisfy the eclectic archivist and historian side in most of us. Min Hyung, who debuted new work this month at Skew gallery in the solo show ‘The Fifth World: An Introduction’, relates her paintings to the viewer-generated focal points of video-games' simulated multi-surfaces. Nesting within a lengthy artist's statement, the Toronto-based artist compares painting to the computer screen: "The PC experience is cold. The canvas flat surface leads to a door that opens to a Utopian world that is warm and organic. Painting becomes real because experience is real." Immediately upon entering the gallery, two taller-than-life-size figurative sculptures loom over the viewer and gaze towards the rest of the exhibition, perched like guardians at a Sci-Fi convention. These sculptures are made entirely of inverted puzzle pieces fastened upon mannequin bodies. The masses of puzzle pieces, their glossy coloured sides almost entirely hidden from view, suggests a kind of fur, and if not for a distracting segmentation line mid-figure, this illusion might have overridden the instant digestion of these otherwise classic figure poses. 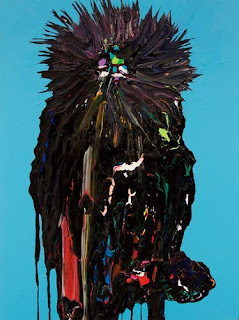 Whether deliberately or by association, Hyung's sampling of much of the popular and prevalent painting styles of recent Toronto painters - the melted pools of paint from Brendan Flanagan and the sculpted figures of Kim Dorland for example - dominates much of the content of her new work. Riddled and crammed with candied, collaged, and sculpted paint, Hyung's portrait-like depictions of apes and other figures often appear to favour technical skill over invention. The artist has provided short descriptions for each painting, describing creatures with humorous solutions to physical and sexual needs, longings, and base functions, which usually end in bodily de-evolving, shape-shifting, and motivations reminiscent of animated characters that directly reference the liquidity of their own body-mediums. Hyung matter-of-factly describes the painting "Hoark", a seated monkey in multi-colored rings of paint sporting a rainbow from atop his head, who is defeated by "his massive ego" which "will not allow him to use words that most will understand, so he basically talks to himself". Of the painting "Makki", Hyung states, "everything Makki acquires he must make it a part of his body...permanently attach[ing] his acquisitions right into his flesh for all to see." These are funny and apt descriptions of Hyung's paintings, suggesting that the artist is aware of her own work’s presumptions and limitations. 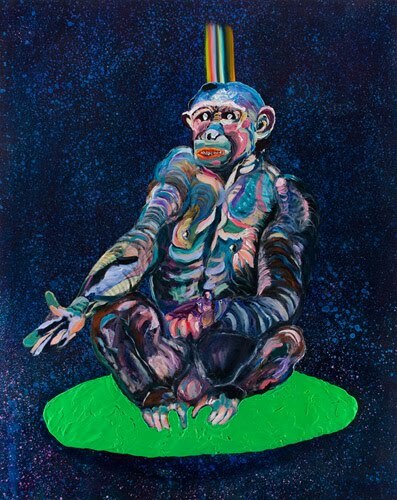 In 'Banja', another ape figure floats centrally across a mottled background of galaxy blues while a distant squiggle of fleshy strokes beneath him suggest a floating figure in an idyllic grotto. The ape-figure huddles awkwardly on his back upon what appears to be a soggy sandwich-as-hoverboard. Hyung has chosen to reduce her scattered repertoir of painting styles here to carefully sculpted paint within thick and fleshy grounds, her melted pools focused within tiny areas of delicate tones in ginger hair, tiny pockets of skin folds, and the wrinkled pinks of jutting feet. In 'Boldingo Beka' and 'Sutak', Hyung allows her talent for sculpting the figurative form to bear full weight without the distractions of wallpapery backgrounds. Not afraid to sully and extend the idea of a figure and face, Hyung has allowed the creatures in these paintings to gaze through the idea of body as well as faciality. Plastic colour peeks out of the cracked and thickened skins of muddy darks. Tuber-like appendages and tongues of melted strips, rather than merely adorning a surface, seem to have their own logic through the act of painting. 'Homan 2' is a painting approaching a certain logic of painted figure-in-a-landscape. A central ape-figure suggests a cross-legged rule in the midst of multi-time-zone, multi-landscaped space, but without the decorative generality of a screen. Hyung has drawn and rendered vulnerable figures that, in their half-formed procession, defy arbitrariness and appear to be challenging the hierarchy of their central idol. When Hyung isn’t placing her figures upon deliberately flat and ornamental grounds, she’s extending their otherwise congealed edges into landscapes made up of the skin and body of their making, thereby more successfully proposing her own rules upon overly familiar techniques. 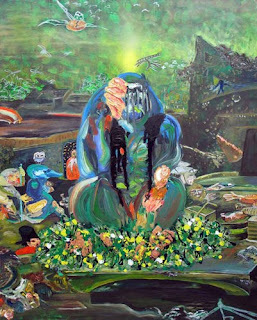 Through a more considered use of the role of paint in her personal narratives, it is the worlds within these paintings, rather than Hyung's accompanying text, that will successfully seduce and claim their own stakes. Dropping in on the public open house for the brand new Lois Hole Hospital for Women, the five-floor, state-of-the-art facility costing $190 million dollars appeared to be worth every penny. Serving as a hospital within the Royal Alexandra's new 33 000-plus-square-metre Robbin's Pavilion, the building will certainly offer the highest quality of care for women in Alberta and Northern Canada facing high-risk obstetrics, cancer surgery and specialized gynecological services, all the while integrating the affect of art and design. Extended window panes cover the building from top to bottom emphasizing open space and natural light. Coming in from the main building of the Royal Alex, I was distracted before even entering the Lois Hole Hospital as I looked up and saw the new public art work by Liz Magor and Wendy Coburn. "Soft Spot," a nest-like cantilever resting up in the sky activated the public space in a way that could only work for low-density areas as it needed the open sky for a backdrop. Coming specifically to see the four new large-scale works by Edmonton-based painter Nicole Galellis, I wandered down to the ground level where the outpatient clinics are located. Taking a quick tour of the clinics, each room is not only already equipped, but has a framed original photograph. While the photographic works are a bit cliché and brimming with optimism—the modern day equivalent of the kitten photo the nurse asks you to look at before the needle goes in—they're certainly a far better option than a blank wall. Unlike any other hospital, where upon entering there is usually an overwhelming sense of clinical sterility, the Lois Hole Hospital for Women was actually a calm space. Granted, there were yet to be patients admitted, but perhaps the precedence for peace will persist. Entering any number of the five clinic entrances and facing a series of outdoor apothecary jars in muted tones by Greg Pace that are supposed to conjure the silhouettes of women, Galellis offers an apt contrast in her bright and bold use of influences ranging from graffiti to wallpaper, textiles, ceramics and of course, floral for the building's namesake. 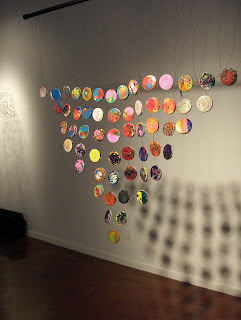 Individually named after the cursive text embedded within each work (Connect, Fit, Join, Bind), Galellis focused on bringing in elements that would connect patients and visitors alike to relate to the works of art. "Even if it's just reminiscent of something they've seen, then it's easier to connect people to the work," Galellis notes. "Paintings change a space, it shows someone's hand. Like good graffiti, it's work being made for the public. It's personal." Each piece sits at approximately four metres by two metres and the works will be viewed by approximately 24 000 patients each year. Painting in abstract form, one that Galellis admits has the potential to alienate people who feel like they are having the wool pulled over their eyes with something they do not understand, her paintings are playfully engaging and leave a fresh impression each time you look upon them. Continuing, she offers, "Western medicine has a growing awareness of emotional health being connected to physical health. Art is optimistic and people turn to it." 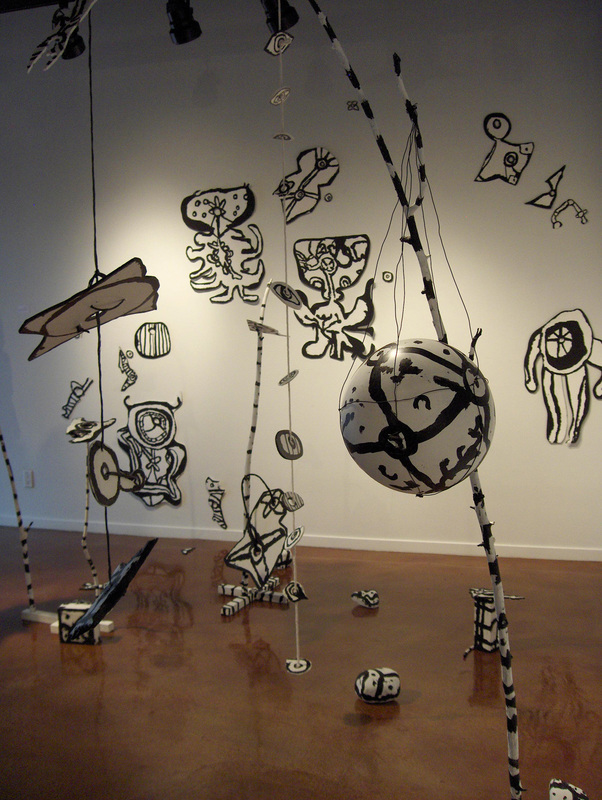 The most immediate impression as you walk into the 2010 BFA exhibition is a sense of maturity—maturity both in the works of art and their presentation, and maturity in relation to undergraduate shows of recent memory. Showing a professional sophistication from the catalogue to artist cards to the layout and flow of the show, the exhibition as a whole makes an effort to stand out within its own lineage, and certainly succeeds on that aspect. With strong works leaning heavily on technical achievements, the majority of works this year surprisingly are not void of experimentation and concept. While there is a good variety within each medium of painting, drawing and intermedia, sculpture, and printmaking, the cross-pollination between the different areas of FAB are certainly evident in this year's showing. With more traditional figurative sculptures and prints and some memorable works from Emily Soder-Duncan and Nicole St. Jean in the front room, upstairs, Mindy Hein's process-laden paper works greet you with a palpable sense of the tactile and the obsessive. Puncturing holes that resemble more closely craters devastating the text and page, the works appear to be a watershed between a concept and new direction in an artistic process. Self-identity remains a constant theme in undergraduate shows, and this year Camille Louis's altar of plaster-cast bear skulls gives credence to the animals who visit her in her dreams, and Kim Lew contemporizes old photographs of her parents into how she views them. Ambitious and already making a stir, Alexander Stewart and Micheal Cor dominate the middle section of the main space. Cor, who also serves as the Visual Arts Students Association (VASA) president, channels his days as a strip miner in Northern Alberta and makes a series of paintings—though perhaps they are sculptures that are painterly, reclaimed—and a revision of our steel-and-cement esthetic. Stewart, on the other hand, has a hidden video installation around the corner towards the fire escape, expanding first the perception of the gallery space and an all too real simulation of heat. His other piece, "Gently Down the Stream" employs the ready-made of a toilet bowl (with water) and the engagement of the audience. Placing a series of $5 to $20 bills folded into little boats, Stewart is keeping track of how much money will be taken. Confronting the audience, he is asking them if they will take money out of a toilet (and on opening night, the tally thus far revealed many will). While the idea hasn't been fully developed, the execution of the experiment is enough to marvel at for now, but this is where time will tell who will grow into a mature artist and who simply enjoyed the artistic exercises. In the mix are undoubtedly some works that mimic their instructors more than expressing their own voices, but the show as a whole was certainly one of the strongest seen in years. However, if compared with exhibitions outside of the U of A, the show remains quite conservative in trials and vision, but is a bright and hopeful sign of change in the department. Activating the spatial parameters of the Stollery Gallery inside the Nina Haggerty Centre for the Arts, Repetition is the product of six months of work with artist and facilitator Sherri Chaba. Focusing on the act of repetition as applied to found materials, the works by Scott Berry, Christine Jarock, Kenneth Hayward, Kevin Ashton, Raj Bagwe and Chaba herself range from the fantastical to the political, all the while creating a new perspective on how the gallery space can be engaged by Nina Haggerty artists. From a black and white 3D cartoon of a futuristic dog park to intricate hanging wire sculptures emulating the physical manifestations of brain injuries and recoveries, the works from the Nina Haggerty Centre demonstrate a real departure from previous 2D works, which while reflective required less awareness of the body, it's perceptions, and choices. Chaba's contribution builds upon her continuing research on the environmental consequences of human progress and development. Winding across the ceiling of the gallery, a form suggestive of a specter, or a pipeline, leads to the traces of human presence and nature drenched in a black viscous material baring a strong resemblance to tar--or black bile. Completely covering a pair of deserted rubber boots, it is difficult to differentiate between the tar and the boots, both being completely melded together and implicit in each others' presence. The casting of the pipe's shadow around the ground installation only further suggests the staging of an eco-apocalpyse narrative, one that for some are already underway. Since opening its doors this past fall with a much celebrated opening including the Minister of Culture, Lindsay Blackett along with Mayor Stephen Mandel in attendance, the Nina Haggerty Center for the Arts finally has a place to call home. Shifting from its former location on the busy intersection of 97 St and 111 Avenue, NHC and its adjoining Stollery Gallery now enjoy a certain amount of walk in traffic, and has been connecting to community organizations like PAAFE, Family and Children Services, and Elizabeth House. Located in the newly built ArtsHub building across from the Alberta Avenue Community League, the building project only took two and half years to realize, an indicator of the value and support the center gives and receives. “It still feels new to me,” shares David Janzen, Exhibition Coordinator and Artist Faciliator, and a celebrated artist in his own right. As an art center for adults with mental disabilities such as down syndrome, autisim, and cerebal palsy, NHC is demonstrating a wide range of entry points for various barriers and symptoms. Once a week since the fall, Gerry Morita, Artistic Director of Mile Zero Dance, has been coming in to teach dance and movement, bringing dance to a community that would otehrwise not be able to access it. But both Freeman and Janzen are careful to note they are not delivering art therapy nor are they a drop-in center. Organized through registered attendance, Freeman speaks on the importance of nurturing the professional dedication of each artist, pushing the activity of arts beyond just recreation and leisure and into a valid pursuit of self worth and purpose. The Stollery Gallery’s most recent exhibition was “Rangefinders”, a low tech photography exhibition with faciliators Wenda Salomons and Candice Makowichuck. Funded by the Lee Fund, the medium of photography opened up new channels to attendees who never took to drawing, painting, or ceramics, finding gratification in the art of pinhole and blue print chemistry. Viewing some of the center’s newly revealed photographers, Melody Zeggelaar, Robin Friesen, and Faye Frick, their respective works on trees, self portraits, and the neighborhood revealed a newly found confidence in exploring their surroundings and self-worth. “We had set up the studios like how we would like it, give them supplies and the space to figure it out on their own,” begins Janzen. Spending last week in Montréal for the 17th edition of The Edgy Women Festival, I return home to Edmonton with the same question two years in a row: would Festival City be open to this type of festival, and how would the works be viewed and contextualized? Last year's festival favourite Jess Dobkin returned with her first full-length piece, "Everything I've Got," and speaking as both a critic and organizer who has been trying to bring this piece into town, I remain at a loss as to which of our city's array of festivals her work could possibly fit in to. It's not just that the performance may be radically queer, which would align it to new kid on the block, Exposure: Edmonton's Queer Arts and Culture Festival, or that the work needs to be understood as performance art, which would fit into Visualeyez: Canada's Annual Performance Art Festival; or that it needs to be formally staged as a theatre piece exploring the physical vulnerabilities of the human body, which would maybe fit into The Expanse Movement Arts Festival. Dobkin's works, like many contemporary works that are of interest, do not fall neatly or even hardly into any single artistic category—and nor should they. The question I am asking is this: if the most innovative works continue to exist outside of our predetermined themes, how will we ever make room for this type of work to be shown here in predetermined Festival City? Shannon Cochrane, who founded and continues to curate Toronto's 7a-11d International Festival of Performance Art gave an exemplary performance of a work that could exist in various worlds, from white-cube galleries to site-specific to black box theatre. Cochrane's work is deeply methodical in its acknowledgment of its own art history, with a focus on intent and transparency. When following performances by old school circus theatre and aggressive contemporary dance from France, Cochrane was not contextualized nor constrained under a single lens, but existed as another shade of artistic engagement. Audience development is always of interest, and always a learning curve when it comes to interdisciplinary work. The audiences that packed Tangente Theatre in Montréal were a real cross-section of the population that could have just as easily shown up to any art gallery, concert or just gone out to dinner. There was no framework that the festival was politically and formally aligning to queer feminist performance works, though that recurring theme was neither a given nor a surprise. This was mostly about a chance to see more women on stage, and though maybe the politics have been taken for granted, they also don't need to be repeated reassuringly into the marketing strategies—the programming should say it all. One of the resulting gems of lining up mixed nights is that no one art form can purport to be marginalized, as there is a false hierarchy between disciplines such as theatre, dance, music, film and performance art that many artists have unfortunately lived up to. Art has been said to be a state of encounter, one that I read as mutually affecting both artist/performer and audience in an almost chemical way that is also visceral and mental, emotional and spiritual. I believe this, and so I wonder why we continue to group our intakes of art into such discrete compartments. While pedantic, disciplines are important for distinguishing formal concerns and progress, though there has always been constant and vibrant overlap between the disciplines throughout history that push each form to grow and remain relevant. Once a discipline has been named, we as artists, audience and media need to remember that disciplines are not fixed, but fluid concepts that should be open for questioning.